Enjoy a scenic Hershey Harrisburg Wine Country tour that combines great wine and great food. 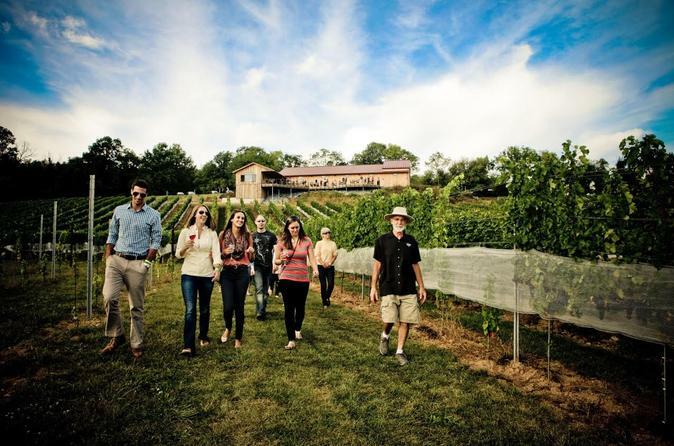 All you have to do is sit back, relax and enjoy a 5-hour wine tour visiting three or four of the Hershey Harrisburg Wine County’s finest wineries. Your personal chauffeur will arrive at 11:00 am at a pick up you choose in Harrisburg, PA with your souvenir glasses, souvenir wine bags, a bottle of wine, souvenir corkscrew and Panera Signature bagged lunches. The wineries and tasting rooms you visit will vary based on the day of week and time of year. You are guaranteed to visit at least 3 locations, but if time allows, 4 locations will be visited. All of the locations you will visit are within a 30-minute drive of each other and you will spend between 45 minutes to 1 hour 15 minutes at each location. Your chauffeur will walk into each location with you and introduce you to the staff member who will be conducting your tasting that day. The chauffeur will also be your personal time keeper, reminding you of the times you need to depart in order to be on time for your next tasting. Each tour will offer 1 enhanced experience, which includes a tour of the vineyard or production center, and a flight of 6 current released wines paired with cheeses, chocolates, fruits, and crackers.